The AR15/M16 Riser Mount from Tapco is an effective and reliable method to instantly upgrade the optic capabilities your favorite rifle. The versatile mount allows shooters to see overtop of existing front sights, meaning users do not need to make permanent modifications when adding the riser. 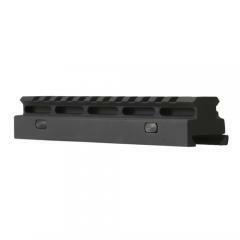 Its standard picatinny rail offers a secure mounting platform for attaching modular optic upgrades such as scopes and reflex sights. The mount is made from hardened aluminum and features a corrosion resistant finish, for extreme all weather use that keeps rifles light and easy to carry. It secures with two thumb nuts and slide plate for easy installation. Easy to install looks great. I believe it would be better with hex or allan head screws for better tightening I'm not real sure of the thumb screws yet.